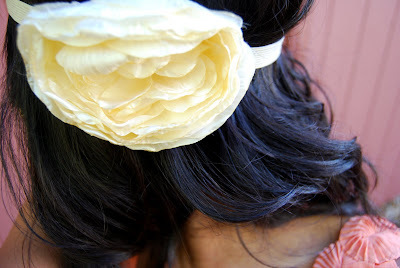 Pearls, floral embellishments and a headband, I couldn't possibly feel more girly today. And this shirt does the trick, yessir. 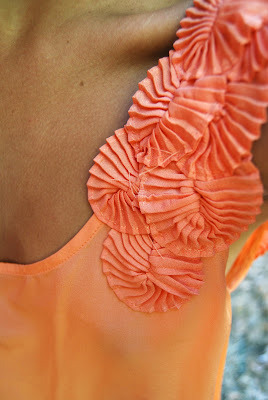 Low scoop in the back, scalloped flowers on the side and this coral COLOR is amazing. It's hard not to feel like some kind of modern flapper in this outfit, which of course, are where my dancing shoes come in. Happy Tuesday everyone! It should be a scorcher here in Reno. Thank God for unnecessary amounts of AC. Love this outfit, great blog. I am following you! I love the floral detail on the blouse. I am totally in love with that shirt, OMG! I love the look. Simply, but pertect mise...! The top is very pretty!!! Great outfit!! Love the flowers!!! Oh your blouse is just gorgeous and i love the headband with it. I like how the top looks with that skirt. Nice choice. love the beautiful flower detail o n your shirt . do you wanna trade links ? Thanks ladies for all the lovely comments! I have to admit, the headband didn't work out for long at work. I couldn't stop adjusting it while I was typing, as my bangs kinda decided to peek lower than they normally do.